In one New Jersey community, a big company is making a big difference. It’s been nearly 14 years since 9/11. For many people, life has gone on. But in some places, like Midland Park, N.J., just 20 miles outside New York City, the loss still feels fresh. When Glenn Jacobsen, LIC, owner of Midland Park-based Jacobsen Landscape Design & Construction, was asked about his company’s latest volunteer efforts, he had to go back a few years, because it was a 2012 project his company was involved with—a 9/11 garden memorial at a neighboring firehouse—that set the standard. Mark Milidantri, LIC, landscape design/sales at Jacobsen, designed and coordinated that 9/11 project. Over two months, the Jacobsen team enticed local landscape contractors and contractors from other trades to donate their time and talents to the garden’s creation. “It was an easy sell because of the proximity of the community to New York,” Jacobsen says. In the end, more than 25 companies collaborated on the memorial over 10 weeks, crafting a poignant tribute to the area residents, firefighters and first responders lost on 9/11. About 300 people attended the garden’s dedication ceremony. It was an emotional commemoration highlighted by bagpipers and the unveiling of the World Trade Center beam. “Designing this memorial garden, being able to rally our competitors and get everybody together for this common cause, it was truly gratifying,” Milidantri says. Over the past 10 years, Jacobsen Landscape has engaged in projects with 33 nonprofits and charities, including family and youth organizations, schools, churches and community centers. Employees, too, are paying more attention to needs in their own neighborhoods and bringing their own ideas to the table, Milidantri says. The management team used to select the projects. Now employees are driving change. For example, Project Supervisor Matt Touw, LIC, had a passion for his alma mater, Eastern Christian High School. And for eight weeks last summer, the Jacobsen crew and partners from 10 companies worked to make Touw’s vision for an outdoor classroom a reality. Most materials for the project were donated by area suppliers and vendors, and the contractors involved were Eastern Christian alumni. 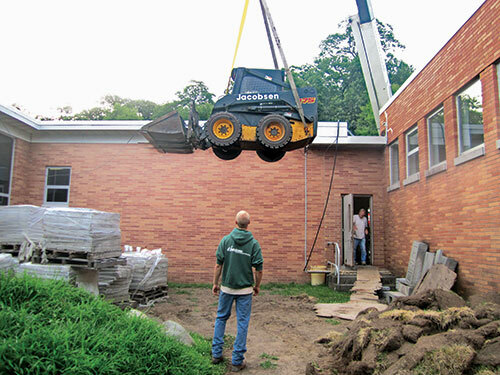 While Jacobsen’s labor on the project can be valued at $6,000, the large-scale project in all was worth about $40,000. The outdoor classroom seats about 30 students. The site also features an area for socializing, a large patio and a garden used to grow vegetables for the community. 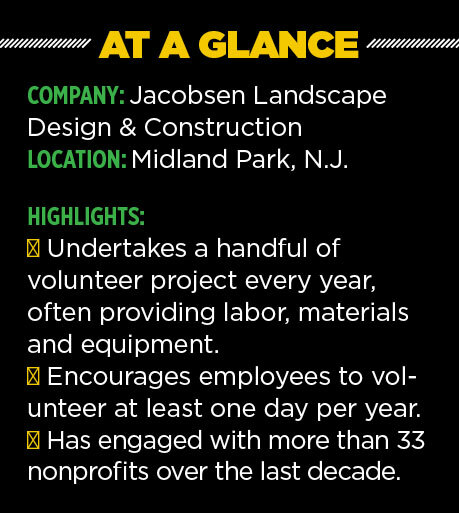 While Jacobsen Landscape has been committed to community service since its origins, it reinvigorated its dedication to the cause in 2007, executing one big project annually in the style of “Extreme Home Makeover.” But there were inherent logistical challenges to that. Eventually, the company took on smaller projects that required fewer people on a team and found its rhythm. As company owner, Jacobsen asks his employees to devote at least one day a year to community service, and between 60 and 90 percent of them oblige. The company values volunteerism because its leaders—Jacobsen and his wife, Melissa (CFO)—value volunteerism. “It starts with me and the management team,” Jacobsen says. On the job, employees get a “feel-good feeling” from helping others on a project, Jacobsen says. Even Milidantri says the 9/11 garden filled him with pride and made him feel responsible for something meaningful. Projects always boost morale, he says.